Routine Thrombus removal during primary PCI is it safe always ? How to humiliate medical therapy for CAD ! Learn how COURAGE and OAT trials were disgraced by the mainstream cardiology community ! Medical profession has evolved over centuries with humble discoveries by genuine researchers in the past . As we pursued science vigorously , we looked for innovations , when innovation work ( or many times shown to work !) we jump to sky , even as some of these innovations fail and crash down to earth , many times we continue to be in the clouds . This is the fundamental problem of modern medical science . When our expectations reached unrealistic proportions , we tend to lose the common sense . Prolonging life and reducing human suffering may be the ultimate aim of the medical profession , but If we try to fight the death with science and money without application of mind , our current life may become miserable ! Thats what is happening for the majority of the population of this planet . After all , death is an essential and final component of life ! Coming to the issue of CAD , in our country , a rich gets a 4th generation drug eluting stent for a insignificant asymptomatic PDA lesion , and poor fellow with left main dies without any intervention .This is fairly acceptable to this uneven world , where a rich westerner dies due to obesity related disease and a poor African dies to malnutrition . Simple life style modification & few drugs for a patient with chronic multivessel CAD , I was made to look ordinary , inferior and funny by many of the current generation cardiologists . Further , the term optimal medical therapy(OMT) for chronic stable angina has evoked laughter in one of the interventional cardiology conferences I attended ! It is a sorry state of affairs for the whole cardiology community , a genuine scientific fact , proven by real life experience as well, is being ridiculed. A similar study which suggested exercise could be better than PCI in the recent 2009 ESC is suffering the same fate ! What if regular exercise were as good as a stent for stable angina? Great medical web sites : How to innovate medical education ? Internet has revolutionised in sharing our knowledge . But , the freedom it gives has a trade off .Identifying genuine knowledge in the vast cyberspace is like searching for lost treasure in the ocean bed. 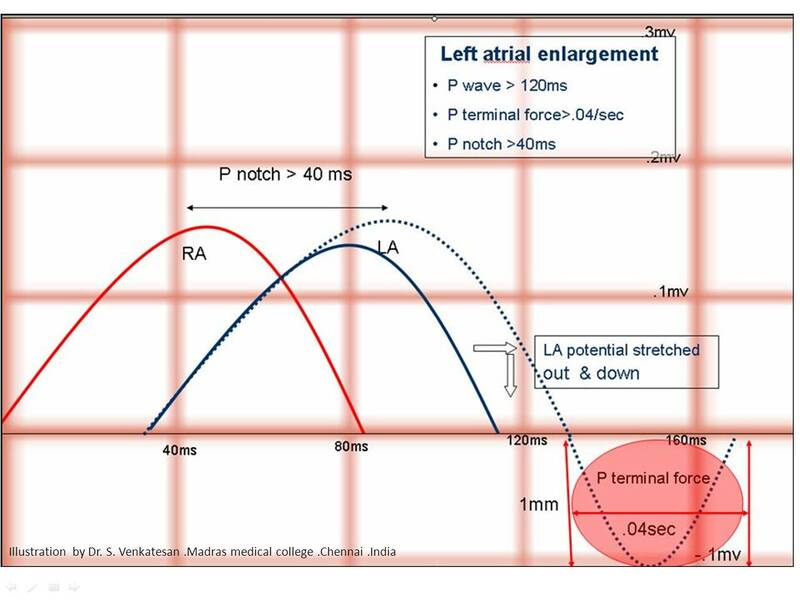 Why P wave becomes “tall” in RA enlargement and “wide” with LA enlargement ? What are the components of Pwave ? RA component : The SA node depolarises the RA first , so the initial part of P wave represents RA current .After about 40msec the wave front reaches LA and it begins it’s depolarisation .LA component :By the time LA is maximally depolarised the RA already starts its repolarisation.So there is overlap and also a short time lag between these two wave forms . This is very important to recognise as , even if the RA conduction is prolonged in pathology the RA component of P Wave still falls within the LA wave .Hence it is not shown in the ECG and P wave is not widened in RA enlargement. This is in contrast to LA enlargement , when the terminal half of P vector delayed it stretches the P wave wide beyond the normal 110ms .Hence LAE widens the Pwave. Why P wave becomes taller in RA enlargement ? Why LAE can not produce tall P wave ? The Left atrial vector which follows RA vector is mainly directed posteriorly and hence inscribe a descending limb of P wave . This causes the P terminal force . So the direction of vector forces and the anatomical locality make a tall & positive P deflection highly improbable in LAE . *Of course when LAE is huge , where a antero -supero vector from roof of LA may inscribe a positive wave . What happens in bi atrial enlargement ? It can have features of both . Tall & wide P waves . Can RA generate a Q wave ? Yes . When RA assumes a huge size , especially if the RV is also at high pressure as in severe PHT or valvular PS a q wave is generated in the lead V1 .This q wave is nothing but the intra cavitary potential of the enlarged RA. What is the difference between atrial enlargement, atrial dilatation, atrial hypertrophy, intra atrial block and inter atrial block ? The p wave morphology has no specificity to identify the various entities. In any pathology of atrium the first thing that happens is a conduction delay ! It is now realised the bulk of the changes we see in atrial enlargement especially in LAE is due to intra and inter atrial blocks or more subtly conduction delay. It is obvious , a wide P wave can occur either due to LAE or simple conduction delay .In elderly hypertensive patients atrial fibrosis is more common , one can not confirm LAE without echocardiogram . A notched P wave can be a very specific sign of inter atrial block .Which is more common in severely diseased left atrium. A notch , slurred p wave is a good marker for impending AF or atrial flutter. Medical pharmacology is not simply learning how a drug acts , it is also about “How a drug company acts*” ! Pharmacology is a major discipline in medicine where we learn how a drug acts in our body for various ailments . Now in this era , doctors need not only how a drug acts but also how a drug company acts ! This has become vitally important for the welfare of the mankind . Should we not clarify what exactly we mean by wide qrs tachycardia ? Some wondered , should we really waste our efforts in differentiating the two . In emergencies it never matters , in fact one need not attempt to do this often futile exercise ! Few dedicated criterias like Brugada etc have helped us . While the difficulties in differentiating between VT and SVT with aberrancy remain over the decades .A less reported , but more common issue is confronting us . Narrow qrs tachycardia 80 ms? Wide qrs tachycardia i> 120ms ? * The confusion is mainly because 20ms difference between limb leads and chest leads . In reality one may not be able to all tachycardia into narrow or wide . * Any VT that arise near the major conducting system of ventricle conduct fast and hence qrs are relatively narrow. Which lead we should look for measuring the width of qrs ? Should we take the narrowest qrs or widest qrs or should we take the average ? Should we calculate how much the tachycardia has widened the qrs from the baseline width of a given patient ? Is it not possible , what is wide for some may be normal for another ! If there is no isoelectric line and ST segment blends with qrs complex how to mark end of qrs ? If limb leads show a narrow qrs and chest leads shows wide qrs what is the significance ? In precardial leads if one lead alone shows a narrow qrs , what is the significance ? Can a narrow qrs VT conduct with aberrancy and making it really wide ? When we are able to solve complex electrophysiological problems , we must also realise even simple tasks can be demanding in medicne ! It is proposed to create a new group “Intermediate QRS tachycardia “that can help solve the issue where we have difficulty in labeling these tachycardias which fall in the greyzone .We can try & apply the modern EP based VT criterias to this group and find out the hidden truths ! Why is absent RS complex in precardial leads is very sacred to diagnose VT ? The most popular criteria to differentiate VT from SVT aberrancy is formulated by Brugada in 1991. The greatness of this criteria is that a single question asked is able to confirm VT in vast majority of cases. How is that, we have been struggling for so long , a single question is able to solve the issue quite easily ? Presence of one of the following three typical complexes Of VT. The third complex is Monophasic R .
So if there is no RS complex it must be VT ! What are the difficulties faced in applying this first step of Brugada criteria ? It is funny to note , in medicine criterias often work perfectly in text books only ! Is there a RS complex seems to be a very easy question ? There lies the catch ! .Even though this criteria may be 100% specific , differentiating RS from QS complex even by an experienced cardiologist may be difficult in a significant number of VT tracings.This realistically , reduces supposedly 100% specificity of this criteria ! Is there absence RS complex in precardial leads ? Yes / No / May be , not sure !